auto clickers are the main target here. using a 69 regularly as you say is not so bad, but apparently the amount of auto clickers used is enough to warrant this change. As for the same tag cant hit each other.....most people doing it use alt accounts that are not in their alliance. and if this was instituted then that would just be the normal way to do it. this seems like a good idea but for a casual player with an everyday pc this docent seem fair and someone using auto clicker with a faster pc will still always have the advantage, whether they fix this or not, they do need to sort out issues such as disconnect which can aid or hinder depending on the circumstances. for example if you can hit a "ring of fire platoon" and then the game disconnects you, not only will they re attack the ring of fire but chances are you will lose whatever platt you sent to attack the ring or the base. seems a lot of issues debating fair play in the game could be solved with better and more reliable servers. that is certainly true, that someone with an auto clicker will still have an advantage. There is literally no way other than an invasive anti cheat program that can stop someone using an autoclicker. That said, tis at least gives regular players a chance to attack since there is time when the old toons leave and the new ones need to come back where they can disrupt the ring of fire and at that point, once it is stopped it is easy to make sure they cant restart it. If you hit the toon and dc, that is just the same as before. disconnects shouldn't increase or decrease based on this change so whatever toons would be lost due to disconnects are the same as whatever would have happened until now. you cannot jump if any of your platoons are engaged in combat. besides, if the guy as to jump out of the sector after 1 or 2 hits thats fine, and when you follow you can likely catch him before he sends the toons to is base to start a new ring, and if not make them jump again. but the main thing is you wont have someone control a sector by attacking without fear of a counter since no one can get through to his base. hate repeating it but.............. i agree with you on others NOT making alt accounts (level 2 ). but kixeyes "lifted the rule on the higher can hit level 31 and lower, (hint kixeyes) make it a rule that no one can hit level 2 to 5 on accounts "including the level 2 to 5 (meaning level 2 to 5 can not hit toons or account bases) that way everyone will stop flooding the servers with fake level 2 accounts to cheat with the auto clickers. it has less coding kixeyes. edited; better yet, put the rule back on that 31 or less can not be hit. i think no one will want their accounts banned for using the auto clicker if they are that high up in level. with the rule that level 2 to 5 can not hit other toons or account bases. but as i said.....even if they can jump out, they are gone for now, and if you want, you can follow and never let them set up in a sector. The main point of the change is to make sure someone cannot go to a sector and be able to stay there for a couple of hours attacking while no-one can attack them back. this makes them have to jump out once the ring starts falling apart. I'll say it again, as long as Infamy and prizes are around, you will never get away from some type of exploits to hold on to their infamy! It's called "**** Fear"! They need that validation. They're not getting it in a proud honorable way, so obviously it has nothing to do with bragging about their skills, only their screen shots!! Auto clickers can not get past the one sec delay - the team did this with raptors to stop end attack glitch . You delay the attack and randomize the hitter so the first click is not the wining click on PVP toons. 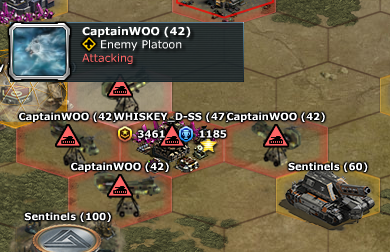 there is no infamy loss when someone attacks your base and doesnt do enough to get a star, therefore, no matter how many times they attack to hold the base, no infamy is ever lost. And if you randomize it that is just unfair , and will end up being a detiment when people are doing an event or high level base, and now it is super easy to steal it because its a random chance for anyone that clicked it, and hitting first doesnt help you. Why try too resolve the issue? Game is on it's death bed. I mean it's a good thought, I mean out of all your ideas this one's seems somewhat reasonable. Not to say this ain't a big issue, but perhaps maybe if kixeye would allow player base to have stronger def for high lvs maybe game would change. Not just that, but to end this dilemma, perhaps I would reinstate dropships that could be targeted. I am against any more features for kixeye to introduce while other issues remain unchecked. Another thing, it's time shadow ops and monthly new units came to a bitter end. At least for a long time. I don't care if kixeye loses money. Like they ain't losing enough already over the massive grind they keep alive to con us to spend. I don't like heavy loses or long repair times. Main reason why game is mostly dead is cuz it's a pain in the arse trying to stay strong enough n learn to take high lv bases while pathetic low lv 30's gain new shadow ops they probably mouched help getting all: siege squadron..., Herald...other powerful units. Same time all units kixeye selling to lazy noobs whom have no business in having said units. Back to the topic, pvp is broken cuz infamy is a bs system. However I don't mind if it stays as is. Honor system is manipulated. See a trend? If it weren't for long repair times, or constant flow of units not needed in the game maybe we could defend our bases aqeduately. I mean I still haven't really learned how to nor nod the time to learn to. I wish this game was a bit easier something like castle clash where you either make or break your ability to hit others n which you aren't out hours if you fail. 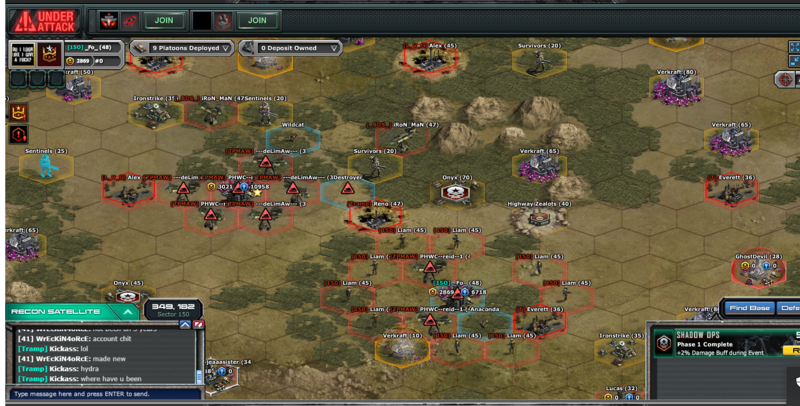 Two losses will result in your platoon retreating to your base. Also, Lol @ Goldendoodle's words. why not FIX the game instead of micromanage a small issue? no one wants to lose their infamy? remove infamy from the equation. oh, no; that would spoil the fun....!!! What I see is you have a few players who use 69 and friendly bubbles to save their precious infamy.. so what is the real problem? infamy. simply said.infamy. "if it ain't broke Kixeye will break it"
ring of fire , and self bubbling. has become part of the game. the same players who cry abouth it. are also asking a clan member to bubble then. after there done. anyone see any 69er being banned yet? i didn't .. as usual kixeye talk but never enforce.. except the fast forum jail when we talk bad about them.